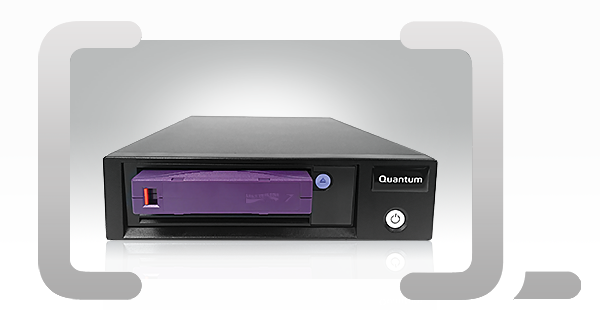 Quantum's LTO-8 tape drives deliver reliable data protection with tremendous capacity and performance at an affordable price. In addition, they use less power than LTO-5 drives, making a "greener" and more energy efficient solution. The LTO-8 drive uses the latest industry-standard interface—6 Gb/sec Serial Attached SCSI (SAS)—to allow for easy installation and integration into your data center. Quantum's LTO-8 tape drives also protect your investment by providing one generation backward read and write compatibility to LTO-7. Keep data secure while not impacting back up or restore performance with hardware-based AES 256-bit data encryption. In addition, LTO-8 is WORM capable allowing companies from healthcare, financial, and other related industries to meet tough regulatory requirements. Quantum "Backup Ready" kit solutions allow you to go from box-to-backup in minutes with the highly reliable Quantum LTO tape drive, cable for external models, a cleaning cartridge, and durable Quantum media. "Backup Ready" solutions are cost-effective, easy to install, and fully supported by Quantum. Choose the Quantum LTO-8 tape drive configuration that is right for your environment: a server-installable internal, convenient tabletop, or space-efficient rack mount.